Rachel Von | The Journal Gazette West Noble's Madison Schermerhorn tries to get around RaShaya Kyle during the second quarter Saturday at Columbia City. COLUMBIA CITY – With 47 seconds to go in regulation, it looked as if Angola's six-point lead, built largely by a nearly transcendent fourth quarter from Hanna Knoll, would hold up and grant the Hornets their first regional championship in program history. While Knoll hit three consecutive 3s and scored 13 points in the fourth quarter, Jasmyn Turner hit a clutch 3 and then got a steal and a layup to pull the Giants within two points in the final minute. Kayla Fenstekmaker hit a free throw for the Hornets, but Ellie Vermillion was fouled on a 3-point attempt and made all three shots to force overtime. The Giants, who played a six-girl rotation and were down to five in the fourth quarter after Ayana Harvey picked up her fifth foul, nevertheless took control in overtime. And while Knoll had been lights-out from the field during the fourth quarter, she missed each of her three shot attempts in overtime. Turner finished with 25 points, while RaShaya Kyle scored 15. Kyle, a 6-foot-6 center, gave the Hornets fits in the paint. 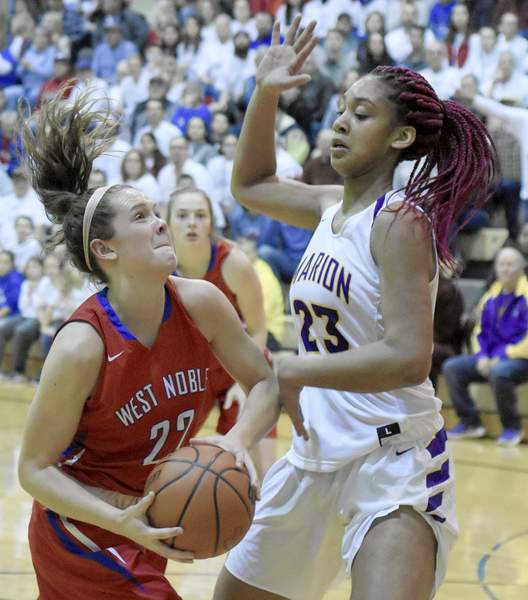 As was the case in their semifinal against West Noble (18-6), the Giants jumped out to an early lead, this time leading by as much as 18-7 in the early minutes of the second quarter. And as in the semifinal matchup against the Chargers, the Hornets fought back, even taking the lead in the fourth quarter while the Chargers only came within two points. But in both cases, just as in their sectional final victory over Bellmont, the Giants' six-woman rotation buckled down and gutted out the victory. Knoll, a sophomore, finished with a game-high 28 points, while Fenstekmaker scored all four of the Hornets points in overtime to finish with 12.